Student athletes, some EMU faculty and supporters showed up Monday night in Ypsilanti to protest the elimination of four EMU sports teams. Eastern Michigan University student athletes, some faculty members and athletics supporters led a rally in Ypsilanti last night protesting the university’s recent decision to eliminate four sports teams. Chris Poland is a wrestler at EMU, and a junior who says he didn’t see the cuts coming. He says the wrestling team just wrapped up a successful season. It was at a 7:30 a.m. meeting back in March when Poland and other athletes first learned their programs: wrestling, men’s swimming, women’s tennis and softball would no longer continue after the 2018 season. EMU junior and wrestler Chris Poland said it was "disgraceful" athletes weren't advised or warned about the elimination of wrestling, softball, men's swimming and diving and women's tennis at EMU. Poland is likely done wrestling for the Eagles. He says he might look to wrestle at another school. Despite the protest and frustration from some students and faculty, the university said in a statement Monday the decision to cut the athletics programs is final. EMU accounting Professor Howard Bunsis has claimed EMU miscalculated how much money it will save by eliminating the four sports programs. Bunsis has claimed EMU didn’t account for revenue that would be lost from tuition paid to the school by student athletes, and other factors. Bunsis estimated the school would actually lose money if it went through with the cuts. The athletic director has made it clear that such savings will not immediately be realized this next year but in the years to come. In addition, the cited report fails to fully incorporate several key items, most notably the institutional aid (vs. athletic scholarships) received by student-athletes, which totals nearly $626,000 annually. It also likely overestimates how many athletes will leave the university. Some protesters said university administrators aren’t looking for the best solutions to financial problems and are mismanaging the schools finances as various departments across the university are faced with cuts. EMU sophomore softball player Ariana Chretien says learning in the midst of the season that Eastern’s softball team will be eliminated after this year has been confusing, because the future seems uncertain, but also a motivation on the field. Mike Bottom, the head swimming and diving coach at the University of Michigan, said he came to the rally to support EMU student athletes. Bottom said he’s donating $10,000 of his own money to support the EMU athletics programs to be cut after the current season. “There’s other ways to do this besides stealing dreams,” Bottom said. 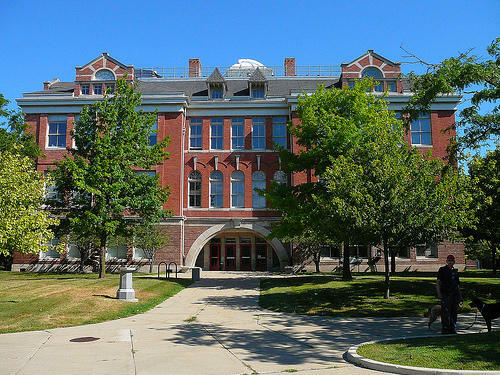 The university says its budget woes stem from declining state support and declining enrollment of high school and community college students in Michigan. 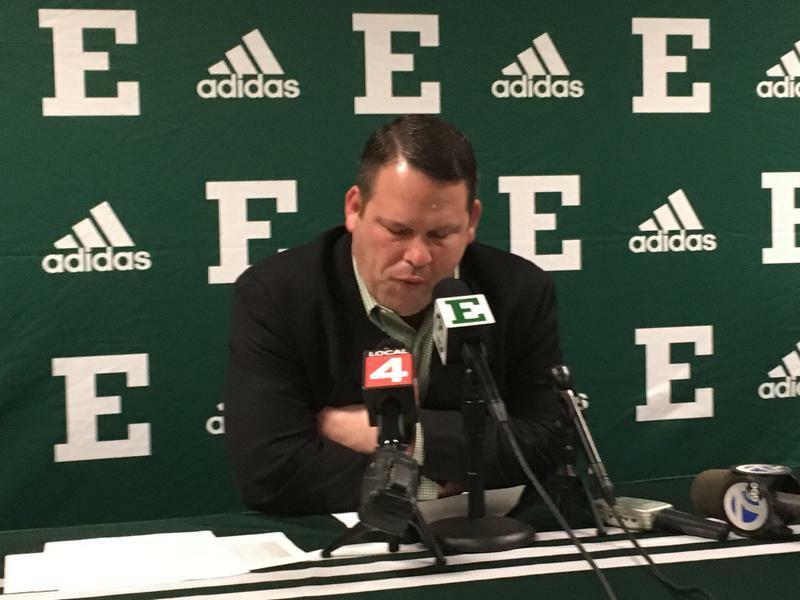 Eastern Michigan University's controversial plan to cut four sports teams to save money will actually end up costing money, according to EMU accounting professor Howard Bunsis. Eastern says dropping wrestling, softball, tennis and men's swimming will save nearly $2.4 million a year, and the cuts are necessary because of budget constraints. But Bunsis says EMU crunched the numbers wrong. He says for one thing, EMU didn't include the loss of tuition revenue from athletes who will no longer attend the university. Eastern Michigan University defended its budget cut decisions in a detailed statement issued late Thursday afternoon. The statement responded point by point to the seven demands presented by student protesters to Eastern Michigan University President James Smith in the hallway outside his office earlier this week. 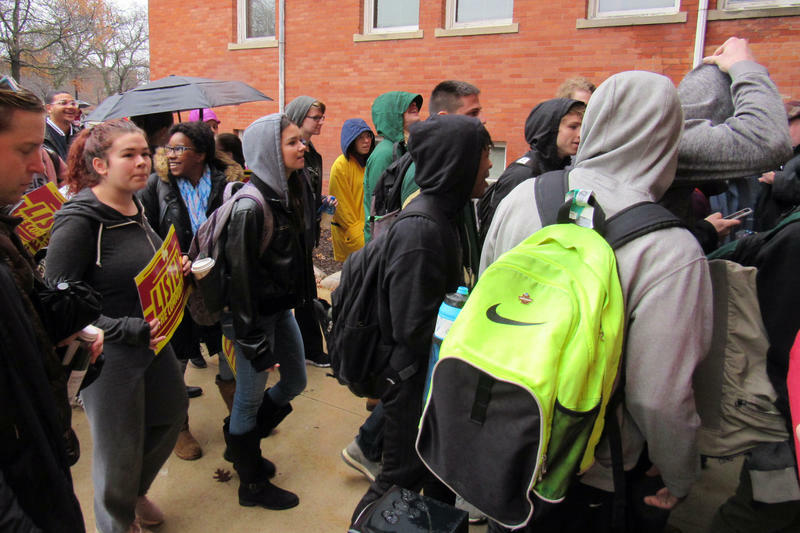 About 100 students rallied in the rain Tuesday afternoon, marched up to the second floor of Welch Hall, and confronted the president of Eastern Michigan University.